Russia is developing a unique satellite network dedicated to monitoring of the Arctic. With her territory stretching thousands of kilometers along the Arctic Ocean, Russian Federation faces many challenges when trying to balance the economic development and the environmental protection of her vast northern regions. In particular, traditional communications and weather-forecasting satellites "hanging" over the Equator are ill-suited for serving high-latitude areas of the globe. To focus latest space capabilities on this crucial, yet hard-to-reach Arctic region, Russian engineers proposed a multi-purpose constellation dubbed Arktika (Arctic). 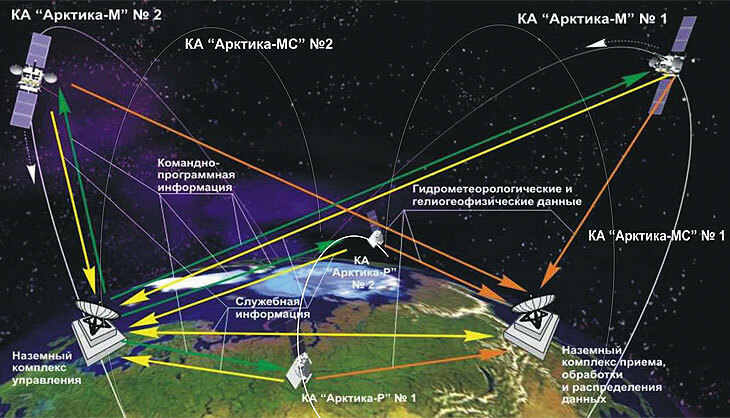 The Arktika network could perform a variety of remote-sensing tasks, such as monitoring of environmental conditions, and also provide reliable communications and navigation across this inhospitable region. The Arktika project was apparently first discussed at the governmental level at the end of 2007 and first publications about the concept appeared in 2008. It attracted a wider attention in April 2010, as then Prime-Minister Vladimir Putin visited the Franz Josef Land archipelago in the Arctic Ocean. At the time, the head of Roskosmos Anatoly Perminov said that the agency would spend 68 billion rubles ($2.3 billion) on the Arktika constellation. The agency reportedly hoped to raise up to a half of required funds from private investors, including foreign partners. In addition to Roskosmos, the Russian meteorological agency, Rosgidromet, reportedly promised to support the project. The majority of Arktika satellites would be launched by Soyuz-2-1b rockets into highly elliptical orbits with most of their orbital path in view of the northern hemisphere. As a result, at least one of the satellites would always be present above the horizon to provide communications, meteorological data and other services over the Arctic. The constellation would be divided into four sub-systems: Arktika-M, -MS1, -MS2 and Arktika-R satellites. A pair of Arktika-M satellites fully funded from the Russian space budget would be focused on meteorology and emergency communications. Each spacecraft will carry a multi-spectral imager, known as MSU-GSM, along with transmitters for meteorological and rescue systems. An apogee (highest point) of their orbit would be 40,000 kilometers above the Earth surface and a perigee 1,000 kilometers. Such orbital parameters would enable frequent overflies of the polar regions with practically uninterrupted view of the northern hemisphere. In contrast, most civilian meteorological satellites deployed in the geostationary orbit can see little or no useful details beyond the 60th parallel, due to curvature of the Earth, while the satellites in traditional polar orbits do not have continuous view of all polar regions. A trio of Arktika-MS1 satellites would comprise a commercial segment whose development was delegated to OOO Gazprom Kosmicheskie Sistemy. 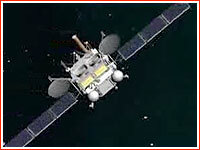 MS1 satellites would be providing mobile communications for the Polyarnaya Zvezda (Polar Star) network. Arktika-MS satellites would be deployed in orbits with an inclination 63 degrees toward the Equator and an apogee of around 50,000 kilometers, requiring 24 hours to complete each revolution around the Earth. The final pair of Arktika satellites, dubbed Arktika-R, was to be deployed in the Sun-synchronous orbit extending from the North Pole to the South Pole of the planet at an inclination of 98 degrees toward the Equator and an altitude from 550 to 750 kilometers. Carrying all-weather imaging radar as its main instrument, these spacecraft would be dedicated to remote-sensing tasks, such as the search for natural resources and measuring of ice thickness, water temperatures and pollution. Arktika-R was to carry a multi-mode radar antenna emitting signal at a frequency from 9.5 to 9.8 GHz. Radar's field of view would cover a swath of no less than 450 kilometers in the so-called "detailed" mode of operation and 600 kilometers in an "overview" mode. The highest image resolution was promised to reach one meter. Privately funded Arktika-R satellites would support the remote-sensing system known as Smotr (Review). Each sub-system of the Arktika network was to have its own network of ground stations. Five main ground centers in Moscow, Novosibirsk, Khabarovsk, Tiksi and Barenzsburg will be supplemented by more than 100 regional ground stations across the Russian Federation to receive and process data from Arktika satellites. In February 2013, the head of NPO Lavochkin told the Interfax news agency that Western countries had been interested in the project, particularly there was a recent meeting with a team from Finland. In 2012, Roskosmos assigned NPO Lavochkin to build Arktika satellites. The agency allocated 5.368 billion rubles for the work on the project until Nov. 25, 2015, enabling first satellites of the constellation to lift off in 2016 or 2017. (Other sources still listed first launch in 2015.) In the first year of development, Roskosmos promised 1.13 billion rubles for the project. NPO Lavochkin planned to use its Elektro weather-forecasting satellite as a basis for the Arktika spacecraft. The company's highly successful Navigator platform, which was flight-proven during the Elektro-L mission, would be used as a standard service module for Arktika, providing three-axis attitude control and other flight-control functions during the mission. Each satellite was promised to have a life span of at least five years. By February 2013, the launch of the first Arktika-M satellite was promised in 2015, but only in April 2018, Moscow-based RKS corporation announced that it had completed production of the MSU-GSM scanning device for the first Arktika satellite and transferred it to NPO Lavochkin. By that time, the launch of the first satellite, equipped with a pair of MSU-GSM instruments, was promised in 2019. The second Arktika-M was now postponed to 2021 and the third until 2023. Another version of the satellite, indentified as Arktika-M2.6, was promised in 2024, to be followed by Arktika-M5 in 2025. In the course of 2018, the delays with the launch of the Elektro-L No. 3 satellite, were expected to have a domino effect on the first launch in the Arktika series. Because the performance of the imaging equipment aboard Elektro-L3 had to validate the design of the follow-on instruments aboard Arktika, engineers needed some time between the two missions to evaluate the quality of photos delivered by the third Elektro spacecraft. As a result, the launch of the first Arktika-M was not expected before 2020, even though, its formal schedule still called for liftoff in 2019, industry sources said. 2021: A Soyuz-2.1b rocket to launch the 2,100-kilogram Arktika-M No. 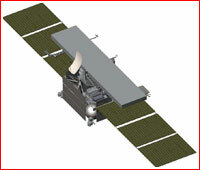 2 remote-sensing satellite. Th launch was originally promised in 2016. In 2015, it was postponed from 2018 to 2019. By 2018, the mission was postponed to 2021. Postponed from 2016: A Soyuz-2.1b rocket to launch the Arktika-R No. 1 satellite into the polar orbit for radar observations of the polar areas. Originally a pair of Arktika-R satellites was planned for launch in 2014, by the end of 2010, the introduction of the system slipped to 2015. (442) By 2012, the second Arktika-R satellite was postponed to 2016. Postponed from 2016: A Soyuz-2.1b rocket to launch the Arktika-R No. 2 satellite into the polar orbit for radar observations of the polar areas. 2007 Dec. 19: The Arktika project is discussed at the governmental level during a meeting of the federal Sea Collegium. 2008 Jan. 22: The Arktika project is reviewed by the Scientific and Technical Council of the Military and Industrial Commission. 2008 Feb. 19: Roskosmos and Rosgidromet representatives discuss cooperation on the Arktika project. 2008 April 24: The Russian government cabinet considers the Arktika project. 2008 Sept. 18: The Russian government doctrine in the Arctic endorses the Arktika project. 2012: Roskosmos awards a contract for the development of Arktika satellites to NPO Lavochkin.